In addition to the incredibly fun Tinker Bell Half Marathon and Tink Half Meet-Up, my second trip to Disneyland last month was further sweetened by the New Orleans Bayou Bash. New Orleans Square, my favorite land and home to the Nightmare Before Christmas cast during the holidays, was even more alive with music, food and dancing - Mardi Gras style! Throughout the day, gorgeous Princess Tiana, Louis, Prince Naveen & several dancers performed music from “The Princess and the Frog”. It was a charming, surprisingly entertaining show, and I was truly blown away by Tiana’s beautiful voice. Along with Princess Tiana, the Jambalaya Jazz Band, the Royal Street Bachelors and the New Orleans Traditional Jazz Band also performed in New Orleans Square throughout this “Limited Time Magic” event. The Traditional Jazz Band procession, with its dancers, umbrellas, colorful costumes and infectious music, really made me want to go home and dust off my sax. I'm a huge jazz fan and a former marching/jazz band member so I was in my element; trying to figure out how to become a permanent band member. I decided to stop for lunch at Café Orleans, where I could sit on the patio and continue enjoying the music while plotting my audition scheme. The weather was perfect and I couldn’t wait to try everything on the special menu. After eating I made my way over to the Court of Angels where I took a photo with Goofy – he in his best Mardi Gras outfit, me in my “I Did It” Goofy Challenge tee. He was pretty impressed with me. 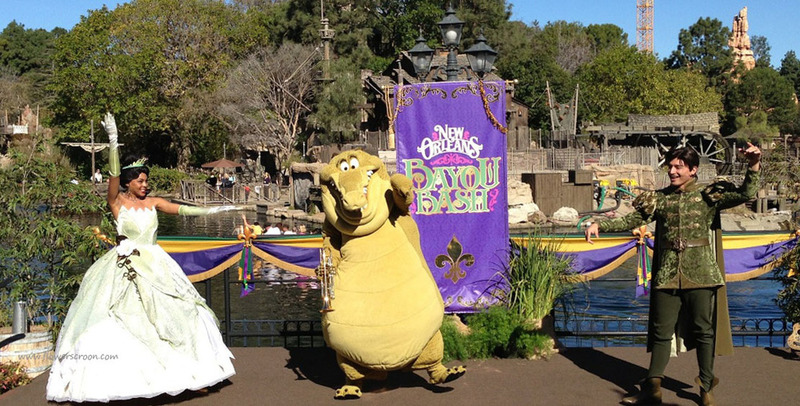 New Orleans Bayou Bash runs through February 12, 2013. Check Disneyland.com for more info!